Is three the magic number for the Yoga? 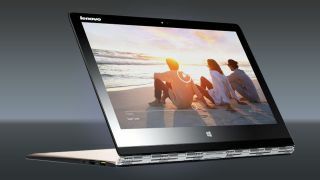 Lenovo has introduced a refresh to its Yoga Pro range in the shape of the Yoga 3 Pro, which is more evolutionary, rather than revolutionary, compared to its predecessor the Yoga 2 Pro. Launched at an event in London, the new device has been an upgraded to include a new hinge design. Moving from a two focus-point model to a six focus-point apparently helped enginners make the machine thinner and lighter. The Yoga 3 Pro is 17 per cent lighter (at 1.19Kg), a mere 12.8mm thick, and 14% thinner than its predecessor. The only other downside is that the battery is smaller (44Whr compared to 54Whr), which partly explains how Lenovo engineers managed to shave around 200g and 2mm off the machine. Inside, the biggest change is the inclusion of Intel's Broadwell-based, Core M processor, the M-5Y70, the most powerful of the three Core M processors currently on the market. It is a two-core/four-threads model with a TDP of only 4.5W. It packs 4MB cache, lists a default clock speed of 1.1GHz and a maximum turbo frequency of 2.6GHz. It also includes an Intel HD Graphics 5300 that supports up to three displays. Other than that, the rest is very similar to the Yoga 2 Pro: up to 8GB of LPDDR3L, a 256GB SSD, a 13.3-inch QHD+ display, two USb 3.0 ports, a card reader, micro-HDMI out, HD webcam, JBL speakers, Bluetooth 4.01 and 802.11ac Wi-Fi. Lenovo will ship the laptop with Windows 8.1 and quotes a 9-hour battery life. The Yoga 3 Pro will also be bundled with Lenovo's Harmony, an "intuitive" software that displays apps differently according to the screen modes. The Yoga 3 Pro carries a MSRP of $1,349 (about £840 exc. VAT, AU$1540) and should be available over the next few weeks.